According to a new report in the Wall Street Journal, the White House is expected to officially send guidance that gives the Department of Defense authority to remove transgender people from the military. The administration is also reportedly instructing the Pentagon to bar transgender individuals from serving, and to stop spending money on related medical treatment for trans service members. Why? Because the president’s insides are composed of malice and bog water. If you’ll recall, Trump announced on Twitter back in July that he would not allow transgender individuals to serve in the military “in any capacity,” an announcement that caught the Pentagon by surprise (the Defense Secretary was only given a day’s notice), attracted a bipartisan rebuke, and (for a 9-minute period) reportedly made Pentagon staffers wonder whether he was about to announce strikes on North Korea. Aside from the massive ethical and legal questions here, there is, of course, no practical reason to do this—for one, medical costs for transgender troops make up a laughably small percentage of the military’s total health costs. The Palm Center, a research institute that has worked with the Pentagon on transgender issues, estimates that there are 12,800 trans military members, and that discharging and replacing them would cost 100 times as much as providing them with healthcare. The Pentagon’s military service chiefs hold a range of views on social issues, including on open service by gays and women in combat. But there was no push from senior leaders to re-establish the ban on transgender service members, officials have said. The White House is expected to give the Pentagon six months to implement this malicious and likely unconstitutional guidance. 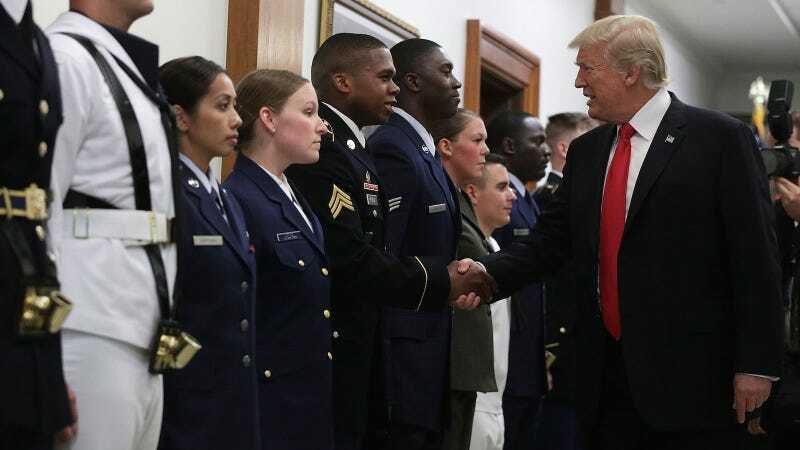 “It is unconscionable that the commander in chief would take aim at his own, loyally serving troops for political reasons at a time when the military needs to focus on real threats,” Aaron Belkin, the director of the Palm Center, told the New York Times.